Alcohol is a drug: the body behaves differently once alcohol has been consumed. Medicinal drugs have side effects enough that a prescription from the doctor is required to gain access to helpful drugs like inhalers. So why is alcohol available in supermarkets? Does it not have as many harmful side-effects as helpful pharaceuticals? The alcohol consumed in such huge quantities in New Zealand, available from supermarkets, is ethanol. We use and abuse it carelessly. But what does it really do in the body? Because alcohol is not a naturally produced substance in the body, it has to be processed to clear it out of the body systems. Chemistry is responsible for this process. Most of the ethanol consumed is oxidised first to acetaldehyde, then to acetic acid. This chemical reaction happens primarily in the liver. Although acetic acid is harmless, acetaldehyde is toxic. Should a person drink lots of alcohol, lots of acetaldehyde will build up. The build up of this toxic compound can cause severe discomfort, nausea and vomiting. The alcohol not processed in the liver is excreted in sweat, urine or given off in breath. The alcohol content of exhaled air accurately reflects the alcohol content of the blood. This is the basis for breath-tests conducted by police. Alcohol causes brain impairment in many ways. Directly, it works as a depressant to decrease the activity of the nervous system. The effects of this are sometimes seen as increased activity, which seems counter-intuitive. In fact while the brain is normally functioning, it controls all body activity and will inhibit some of the possible activity. Alcohol decreases the brain’s control, allowing uncontrolled energy use. Glutamate is involved in learning and memory, while GABA is involved in motor control. Alcohol interferes with these neurotransmitters, preventing normal brain function. Dopamine and serotonin are normally involved in brain reward processes. Alcohol stimulates production of these neurotransmitters and uses them to cause the rewarding sensations associated with alcohol consumption. Brain function can also be altered indirectly by alcohol. Alcohol will affect the immune system and cause production of hormones that end up in the blood transmitted to the brain. It’s ability to alter behaviour can also result in violent behaviour causing head injury. For a more complete list of problems, click here. To see an interesting page of alcohol-related facts, click here. New Zealand law does not allow drivers under 20 years old to drive after consuming any alcohol. Drivers older than 20 years have a blood alcohol limit of 400mcg breath or 80 mg blood, which (by my calculations) should equate to a BAC of 0.08%. Because there are so many variables affecting the way the body processes alcohol, there is no easy way to quantify the amount of alcohol that can be drunk while maintaining enough brain control to safely -and legally- drive. The safest rule: if you are going to drive, don’t drink. Between 2006 and 2010 there were 2698 crashes involving alcohol. Many of these crashes involved impaired brain judgements in safe driving behaviour such as speed selection, overtaking and fatigue. There were 3565 serious injuries and deaths caused by these crashes. Accidents caused by drink driving. Statistics courtesy of the New Zealand Transport Association. 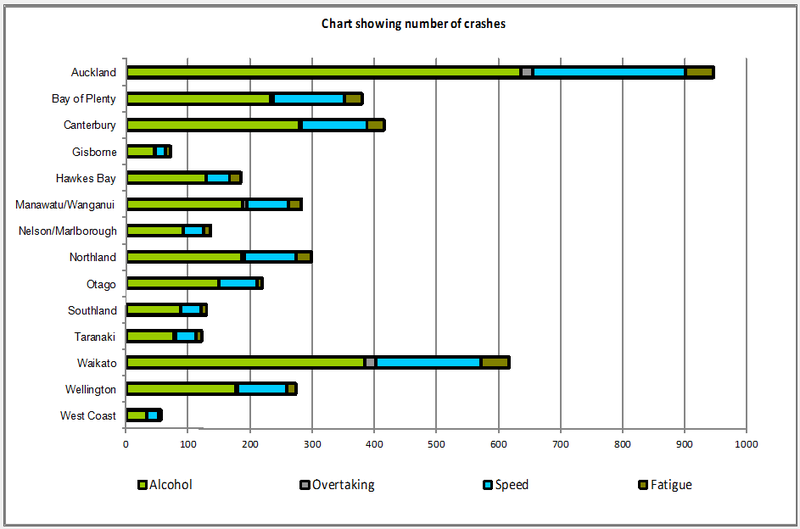 This chart (produced using the NZ Transport Agency Road Safety Reporting tool) shows the number of crashes involving either alcohol alone, alcohol and overtaking, alcohol and speed or alcohol and fatigue. It is clear from the combination of these variables that alcohol impairs good judgement when driving. Alcohol is a drug, even if a prescription is not necessary to access it. It changes the way the brain works and reduces behavioural control and judgement. If you are going to drink, do it in moderation! If you are going to drive, don’t drink. I was breath tested this morning at 8:30 AM at a road block on Stone Street while taking my son to school! Seems an odd time for drunks to be driving but maybe they were after people who were still over the limit from partying the night before. How long does it take for the body to rid the blood stream of alcohol? Wow, that does seem a strange time to be breath tested. I found a website that says alcohol is metabolised at a rate of 0.015% BAC (which should be 15 mg blood) per hour. So depending on how much alcohol was drunk, a person with a high blood alcohol concentration of 150 mg blood should have no measurable alcohol in the bloodstream after 10 hours. But this website points out that blood alcohol concentration will rise for some time after the last drink has been consumed. http://www2.potsdam.edu/hansondj/drivingissues/1127227453.html. It should maybe called the unsociable drug. Certainly the effects of the alcohol can be detected in the blood, or on the breath for up to 10 hours afterwards. When people may be partying until after midnight, then it is quite easy for police to pick up drivers still over the limit as they head to work or taking children to school, even if they did the right thing in not driving the previous night! Moderation instead of “getting wasted” is the best solution, and articles like this which explain the longtermeffects on the body may help if the right people read it. Well done!